Bosch is researching batteries that will make it possible to drive longer distances without recharging, and will also cost less than current batteries. “Our battery experts are playing a key part in paving the way for electromobility,” says Dr. Michael Bolle, president of the corporate sector for research and advance engineering at Robert Bosch GmbH. 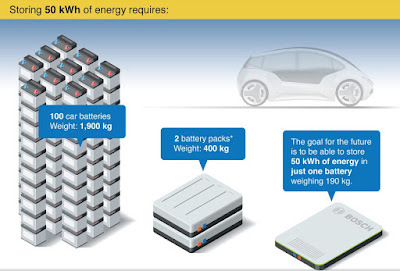 As early as 2020, Bosch batteries should be capable of storing twice as much energy while costing significantly less. The market forecasts are correspondingly bullish: ten years from now, Bosch expects some 15 percent of all new vehicles worldwide to have an electrical powertrain. As a result, Bosch is investing 400 million euros a year in electromobility. Dr. Thorsten Ochs, head of battery technology R&D at the new Bosch research campus in Renningen, explains what will be necessary for progress in battery technology: “To achieve widespread acceptance of electromobility, mid-sized vehicles need to have 50 kilowatt hours of usable energy.” With conventional lead batteries, this would mean increasing the weight of the battery to 1.9 metric tons, even without wiring and the holder. That is the same weight as a modern-day mid-sized sedan, including occupants and luggage. At a weight of 19 kilograms, a conventional lead battery – as found today in nearly every car for powering their starters – stores a comparatively low 0.5 kilowatt hours. Today’s lithium-ion batteries are superior in this respect. They store more than three times the amount of energy per kilogram. At a weight of 230 kilograms, the battery of a modern-day electric car provides approximately 18 to 30 kilowatt hours. But to achieve the desired 50 kilowatt hours, a battery weighing 380 to 600 kilograms would be necessary. With his colleagues around the world, Ochs is therefore working on energy storage media with even better performance. Their goal: to pack 50 kilowatt hours into 190 kilograms. In addition, the researchers are looking to significantly shorten the time a car needs to recharge. “Our new batteries should be capable of being loaded to 75 percent in less than 15 minutes,” Ochs says. Ochs and his colleagues firmly believe that improved lithium technology will make it possible to achieve these goals. “There is still a long way to go when it comes to lithium,” Ochs says. To make progress in this area, his team in Renningen is working closely with Bosch experts in Shanghai and Palo Alto. And as a further measure to advance lithium-ion battery research, Bosch has established the Lithium Energy and Power GmbH & Co. KG joint venture with GS Yuasa and the Mitsubishi Corporation. In theory, the solution sounds simple: “The more lithium ions you have in a battery, the more electrons – and thus the more energy – you can store in the same space,” Ochs says. But because researchers need to improve cells at the atomic and molecular level, putting this into practice is a challenge. One of the main keys to achieving this goal is to reduce the proportion of graphite in the anode (the positively charged part of the battery), or do without graphite altogether. Using lithium instead of graphite would make it possible to store up to three times as much energy in the same space. Ochs and his colleagues have already developed many approaches for removing the graphite and replacing it with other materials. The Bosch CEO Volkmar Denner recently presented a prototype solution at the IAA. Thanks to its purchase of Seeo Inc., a start-up based in Silicon Valley, Bosch has now acquired crucial practical expertise when it comes to making innovative solid-state batteries. Such batteries have one other decisive advantage: they can do without any liquid electrolyte. Such an electrolyte is to be found in conventional lithium-ion batteries, where, in certain circumstances, it can pose a safety risk. Improved lithium-ion batteries would benefit not only drivers, but also all other applications that employ this technology, such as smartphones, laptops, tablets, cordless household appliances and tools, and many more products.